Lithodora represents a perennial grassy plant of the family of Boraginaceae. The homeland of this plant consider North America and Africa. Height of this plant small – only 15 cm. Buds and flowers of lithodora are especially delightful – they have a funnel form and when reveal, their color becomes bright blue. Flowers very small have also no smell, however blossom very magnificently. 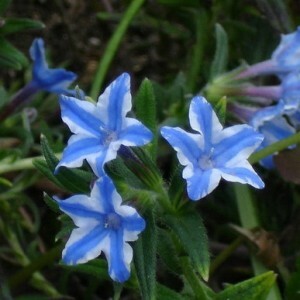 During blossoming, lasting from June to September, blossoming of lithodora forms a live carpet with a diameter of 60 cm. Looks not only beautifully, but also it is effective. The foliage of a plant on the beauty doesn't concede to flowers – its silver-gray color is excellently combined with bright flowers.